Smithtown Auto Trim can help to improve your automobile's sound absorption using our state of the art Sound Deadening technology. One of the most relevant and commonly ignored areas where you can actually achieve a significant improvement in sound quality with any audio system is in sound deadening. Choose to greatly reduce all of the areas of your vehicle that hinder sound system performance- right down to improving mid-bass response. Many of us have simply installed components and have ignored the acoustic limitations of our vehicles, only to find later that we had unwelcome vibrations, road noise or other factors which have taken away from our system's true capabilities. 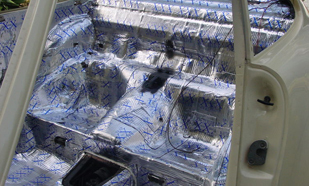 Auto manufacturers have actually provided some levels of sound deadening for years, but this was never meant to address acoustic limitations. Over the past decade, however, there has been a movement within the car audio industry to actually address this problem and thankfully there are several options now available to the consumer.